Published: Jun 15, 2011 to ? What happens when an intruder from the sea stakes claim to your bathtub? A cool yet demure teenage boy named Tatsumi must learn to live with the self-obsessed and playful merman, Wakasa, in a small Tokyo apartment. These two dissimilar young men will learn what it takes to deal with one another in their everyday lives. Of course, impromptu visits by Wakasa's ocean friends―an anthropomorphised octopus, jelly fish, and hermit crab―do not make things easier. Welcome to Tatsumi's bathtub. It's getting crowded. 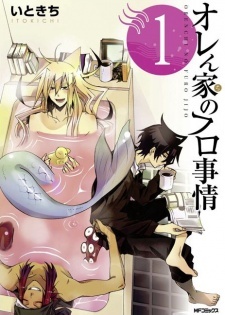 Orenchi no Furo Jijou has been published in English as Merman In My Tub by Seven Seas Entertainment since October 13, 2015. The concept? Strange. The execution? Amazing. This manga is surprisingly funny and amusing despite seeming odd. It also is drawn cutely and is a fun light hearted BL manga. I honestly do not feel the anime did it justice. The characters are believable, funny, and keep you well entertained despite most of the story taking place in a small bathroom. It is one of the best BL comedy series targeted at fujoshi fans that I have read. It is refreshing and I am glad it got an adaptation even though I feel (the adaptation) could have been executed better in comparison to the beautiful artwork of the story.